Driver of the day ? Round eight of the 2009 FIA Formula One World Championship takes place at the Silverstone Circuit which is close to the majority of the teams’ headquarters. Half the circuit is located in Northamptonshire and the other half in Buckinghamshire. The circuit is constructed on the site of a former World War II airfield, RAF Silverstone, and its three triangle format runways lie within the outline of the present track. Host to the Silverstone Classic, the British round of the FIA International GT Championship and several premier British Championships including British Touring Cars and British Superbikes the circuit remains popular among motor sport fans in Britain and worldwide. 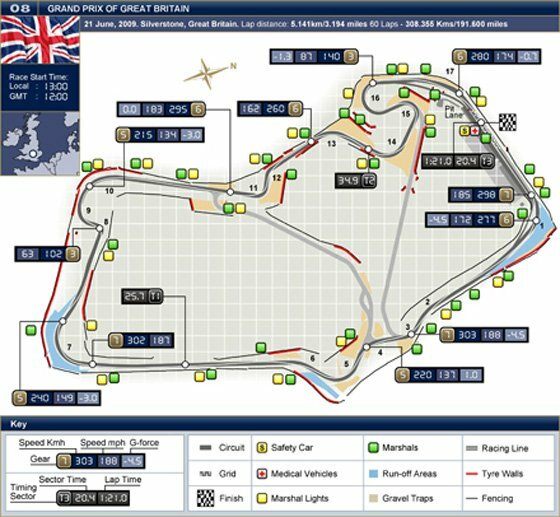 Silverstone is one of the fastest races on the calendar and the flat circuit is made up of a series of long straights connected by fast open corners making for a physically demanding challenge for the drivers. Copse is the fastest corner around Silverstone with Formula One cars taking the bend at speeds of up to 285 km/h. The circuit can be reasonably tough on engines and drivers spend around 68 per cent of the lap at full throttle. • The guardrail on the driver’s right between turns 10 and 11 has been realigned. • Over 600 highly trained volunteer track side marshals will be on duty at the event. This includes 290 fire and course marshals, 75 flag marshals, 50 observers and 30 incident officers. • Throughout the Grand Prix, a team of 100 medical staff, including 40 doctors, will be on site to deal with any medical problems among the competitors or visitors. • 24,000 litres of paint were used in preparation for the event. Last edited by Ed on Mon Jun 22, 2009 1:17 am, edited 1 time in total. It should be interesting to see how the ferrari updates work here. FOTA Lawyers could easily tie it up in court til they are both dead. Which is exactly what I want to see. The lawyers at work, or both dead.....hhhmmmm, I think I can work that one out. Barrichello also goes for a second installation lap. Looks like he isn't using the new front nose. Probably doing comparisons. The track is quiet now! does the RB have a new nose n tail, Ed? With the news that FOTA intend to setup a new series and the FIA declaring that the deadline stands and the entry list will be published tomorrow, it is war in F1.